Do you have a sleep apnea machine or know some one that has one? For anyone that uses a sleep apnea machine, they know first hand the challenges of keeping track of the various components. Keeping all of this organized on a regular nightsand often creates a sense of clutter and more imporantly the nature of the sleep apnea machine creates a hospital feel to your bedroom. Fortunately my wife has been understanding of the disorganized aspect of my using a sleep apnea machine. Some of my famliy has suggested that it reminds them of a Michael Jackson hyperbolic chamber look! In addition to the day to day clutter associated with my sleep apnea machine, the process of packing up and getting ready to travel means searching in the nightstand drawer for all the components. Traveling with these machines is not easy and I often do not take the humidifior and just travel with the basic sleep apnea machine. Now there is a way to organinze all of the items associated with your sleep apnea machine and equipment. The folks at Perdue Woodworks unveiled a new line of night stands specifically for sleep apnea machine users. This new line of nightstands was introduced in January of 2014 and has gained instantly popularity! Four styles and finishes are offered to fit any bedroom décor and also match four of Perdue’s most popular and newest bedroom groups. 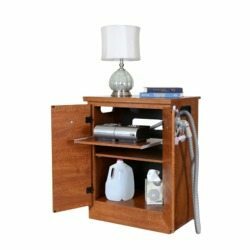 The sleep apnea machine nightstand retails between $150 and $200. Behind the decorative doors is a roll-out shelf for the sleep apnea machine (any manufacturer’s unit), providing easy access for the machine controls and for filling the humidifier. The bottom shelf provides storage for gallon bottles of distilled water and any extra storage requirement. The hose portals on both sides of the unit allow the hose to move freely when pulling out the sleeve and when in use. This makes the your apnea machine usable on either side of the bed. The shelf will fit two cpap/bipap/v-pap machines so it can be used between two beds to accommodate two sleep apnea patients. President Richard Perdue says "this innovative nightstand will take the room from a look of a hospital ward back to a decorative bedroom freeing your nightstand top to hold a lamp, clock, phone and other personal items. These nightstands allow the CPAP user the luxury of convenience, comfort and are aesthetically pleasing." Editor's note: As inidicated earilier in this article, I have been using CPAP machine for over 20 years. By the way, CPAP stands for Constant Pulomonary Air Pressure. I lovingly re-named my CPAP the "Snore No More" and have had a lot of fun over the years with this name. It also adds new meaning to the phrase "up your nose with a rubber hose". All the kidding aside, sleep apnea is a dangerous condition if left untreated. When I found out that this condition may shorten your life and your mental capacity, I got with the program and religiously use it every night.